The STFK Science Café is a local chapter of the NOVA Science Cafés community and has been meeting monthly since April, 2011 to promote science interest and education. We begin each meeting by watching a 10-minute NOVA video about a science topic. This is followed by a Q&A discussion in which attendees have their questions answered by a guest scientist. This is a casual, fun, engaging dialog for adults and mature teenagers. Beginning February, 2019, the STFK Science Café is co-sponsored by Spirit and Truth Fellowship of Knoxville (David Spakes, Pastor) and Associated Professionals Think Tank (David Fox, 865-803-2887). Children age 5-12 are welcome at attend with their parents, and we will keep them busy at Kid's Café with a science lesson and activities that help make learning science fun! 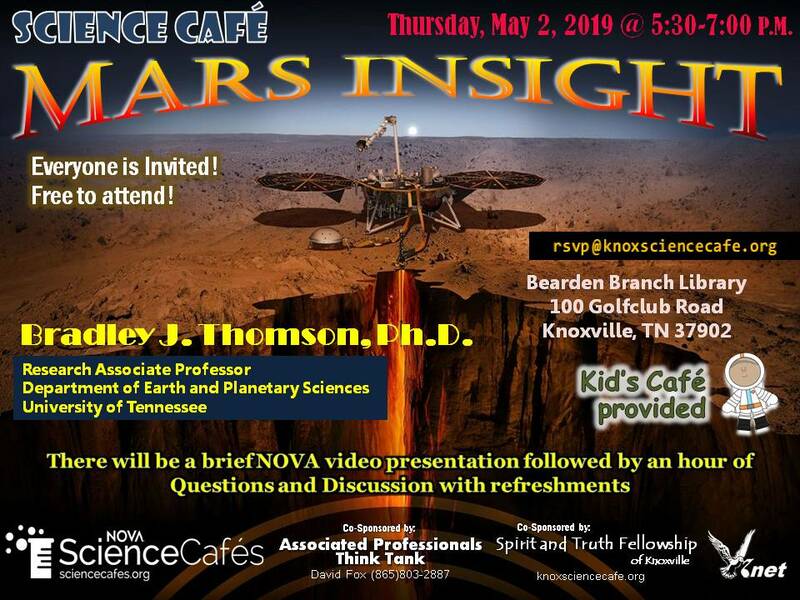 Please RSVP by sending an e-mail message to rsvp@knoxsciencecafe.org. Let us know how many adults and children are in your group. Presenter: Bradley J. Thomson, Ph.D., Research Associate Professor, Department of Earth and Planetary Sciences, University of Tennessee. Date: Thursday, May 2, 2019, 5:30-7:00 P.M. Location: Bearden Branch Library located at 100 Golfclub Rd, Knoxville, TN 37902. The meeting room is on the left after you enter the outer doors.